Despite budgetary and resource constraints at the Internal Revenue Service, corporate boards, securities regulators, and even the IRS are pressing to see increased transparency, greater speed, and enhanced precision on the part of large business taxpayers, according to KPMG tax professionals Mike Dolan and Tom Greenaway. Dolan is national director of IRS policies and dispute resolution in the Washington National Tax practice of KPMG LLP and is based in Washington, D.C. Thomas Greenaway is a managing director in the tax controversy services practice of KPMG LLP and is based in Boston. This article includes input they provided on the topic of efficiencies in large-case tax administration. Their comments represent their own views and do not necessarily represent the views or professional advice of KPMG LLP. Audit, tax, and advisory firm KPMG LLP is the U.S. member firm of KPMG International Cooperative. KPMG International’s member firms have 162,000 professionals, including more than 9,000 partners in 155 countries. “We would expect the IRS Large Business & International (LB&I) division to apply many of the changes it is currently considering to a wider swath of cases than just those meeting traditional CIC standards,” say Dolan and Greenaway. The IRS is operating under more severe budgetary and personnel limitations than it was a decade ago. “Overall budget reductions have reduced the number of IRS personnel assigned to examine the largest entities,” say Dolan and Greenaway. For example, they explain, the total number of examiners and specialists employed by the IRS in the last five years has been cut through attrition. In addition, the IRS training budget has been cut significantly in the last several years, and the agency has reported that it has been forced to reduce its investment in new technology and other administrative tools and resources, which collectively place the service “at a great disadvantage when compared with the entities they are examining,” according to Dolan and Greenaway. Notwithstanding IRS budgetary and resource restraints, management, boards, and other regulators keep demanding greater speed and precision from tax executives, note the KPMG professionals. The move toward more speed and accuracy requires taxpayers to “find facts faster; manage and access large volumes of data; apply technology such as predictive coding to the data; and present results in a timely manner to management, financial statement auditors—and the IRS—for review and testing,” explain Dolan and Greenaway. The IRS is not the only agency that is taking a closer look at documentation and accuracy in reporting financial transactions. SEC comment letters frequently mention tax issues. And for the first time since 2008, the SEC is increasing its enforcement of alleged accounting fraud. Robason is the national partner in charge of tax accounting and risk advisory services for Grant Thornton LLP in Dallas, Texas, and served as a member of the advisory board for Tax Executives Institute’s 2011–12 Corporate Tax Department Survey. In addition to precision and speed, there’s the issue of transparency. The drive and public pressure toward increased transparency is ubiquitous in our society—from disclosures in clinical trials to financial records demanded of our elected officials. It’s no different in the tax arena. For example, say Dolan and Greenaway, the passage of the Sarbanes-Oxley Act resulted in greater sensitivity to tax behaviors and risks throughout corporate governance. A long-term trend demands more and more transparency from large taxpayers, they assert, citing as examples Form 8275 (see box on p. 32), Schedule M-3, and Schedule UTP (uncertain tax positions). The OECD’s base erosion and profit-shifting (BEPS) initiative is yet another example of tax administrators’ efforts to drive taxpayers to be more transparent. “A key objective of the BEPS project is to increase transparency through improved transfer pricing documentation standards, including through the use of a country-by-country reporting template,” according to the OECD. 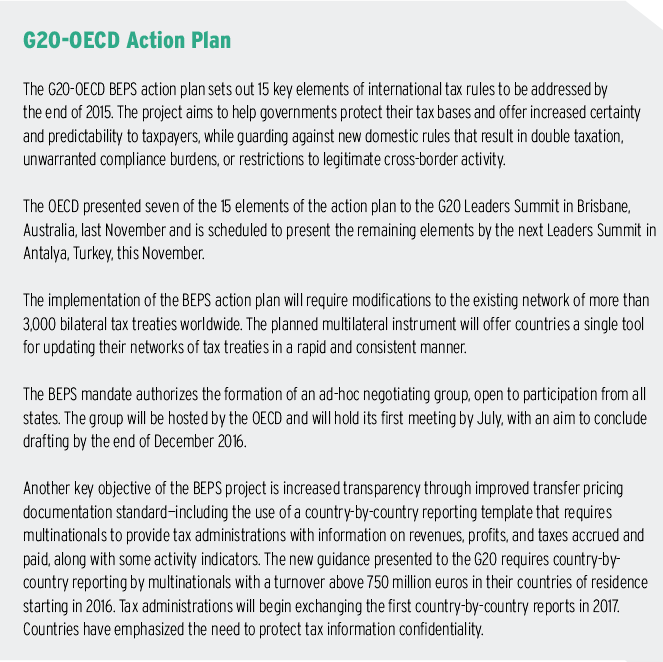 The G20-OECD BEPS action plan on guidance on the implementation of transfer pricing documentation and country-by-country reporting, which illustrates the movement toward increased global transparency, was released in February. (See sidebar). So what happens when the rubber meets the road—when the IRS, strapped for resources, confronts taxpayers looking for greater precision and speed in resolving tax issues? Many tax issues, such as bad-debt deductions, basis calculations, earnings and profits, foreign tax credits, and research credits require an ability to digest, synthesize, and analyze massive amounts of data, note Dolan and Greenaway. “Owing to constraints on its budget, technology, and process, traditional IRS examination teams are not well positioned to evaluate huge amounts of data with an eye toward finding the materially correct answer. Quite understandably, when presented with unorganized or incoherent data, the institutional and inherent skepticism of the IRS audit function takes over, they explain. “It is important to prepare strong valuation and transfer pricing analyses, for instance, before an IRS specialist does,” say the two tax professionals. Taxpayers should therefore adopt an approach that leverages technology to marshal all the relevant information into a reliable data set, then couple the data with a strong, credible analysis. “Generally, when reliable data is paired with rigorous analysis, it is easier to establish the correctness of the taxpayer’s position. The IRS then has an opportunity to undertake only modest testing and sampling of the data and look for quicker resolution, which is in everyone’s interest,” assert the two KPMG professionals. To reach reasonable resolutions on complicated fact questions, tax executives must be aware of—and consider using—the IRS’s early certainty programs, say Dolan and Greenaway. And remember, they add: There’s often the possibility of custom-tailored dispute tools, such as compliance agreements, to resolve complicated issues. For instance, erroneous Form 1099 or Schedule K-1 reporting can affect tens of thousands of taxpayers. Entity-level compliance agreements offer a way to cut the administrative and investor-relations burden in these cases down to a minimum. In the last several years corporate America has shown a remarkable appetite for early certainty in tax—influenced in part by FIN-48. Beyond that, corporate governance policies often place greater emphasis on tax risk-avoidance or reflect the desire not to be identified in the media as a tax outlier, Dolan and Greenway say. Obtaining tax certainty sooner has become a matter of competitive advantage across some industries, starting with retailers and spreading to others, even financial services. Because the government faces continuing budget challenges, these types of programs may be viewed by some in the IRS as being luxuries or simply too costly. As good as these programs are, they currently come with their own considerable complexity. Dolan and Greenaway suggest that it is not only important to maintain the current pre-filing agreement (PFA), advance pricing agreement (APA), compliance assurance process (CAP), and industry issue resolution (IIR) initiatives, but that broadening their reach could help the IRS by limiting what needs to be addressed in post-filing examinations. “Taxpayer submission of issues into these pre-file programs also provides the IRS a valuable window into current types of taxpayer transactions and issues—often months and years before the IRS might see the issue on a tax return,” they explain. In general, corporate voluntary disclosures, where the company uncovers an error and seeks to correct it, have become more difficult to accomplish in recent years because of IRS resource constraints, Dolan and Greenaway say. In this regard, the two tax professionals suggest two alternative approaches that might be considered. The first would be for the IRS to create a disclosure/correction application process, which is less formal and more administrative than the section 9100 relief process. Under such a program, a taxpayer could identify, disclose, and correct its error or omission in an expedient manner without threat of penalty and with an agreement to pay requisite interest or other compliance tolls where appropriate. The second approach would be to formalize a true-up regime, wherein a corporate taxpayer that discovers an error after it has filed its return can true-up the issue on the next filed return and pay any interest (but no penalty) that might accrue. As a practical matter, these regimes already exist, in places, for well-represented taxpayers and CIC taxpayers who enjoy good relationships with their examination teams. They should be available across the board, suggest Dolan and Greenaway. The IRS could provide those taxpayers classified by the IRS as low to moderate risk with a template for self-audit of identified material issues. Either the company or its adviser could complete the self-audit, which could then be tested for accuracy by the IRS and serve as the baseline from which the need for any further examination activity is evaluated. A similar self-audit could take place of any items included on a taxpayer’s UTP schedule. The IRS could invite submissions through its service center classification function, offering early certainty in a fraction of the time currently required for a PFA. The IRS could identify both issues of interest and its substantiation standards, giving taxpayers the option of completing an assessment against IRS benchmarks.